Brakes are some of the most used components of your car. When you drive in stop-and-go traffic or when you consistently wait just a little too long before slowing down, your brakes get more than average wear and tear. Replacing the brakes every so often is a must, but exactly how often will depend on the type of driving you do and the quality of the products your garage uses. At Felix Auto and Tire, we use only high quality products installed by the best people in the business! When you start to hear your brakes make a screeching sound, you’ll know it’s time to have them looked at. If you aren’t sure, our helpful team will gladly check them out for you. Brake Pads – The brake pads should be changed every 50,000 miles, but be advised that this is only an estimate! Many factors contribute to the frequency with which you have your brake pads changed. You and your Felix Auto and Tire technician should decide on a schedule that works for you. We’ll check for brake pads that are at least ¼ inch thick. Brakes – The brakes on your vehicle can get dust and grime inside them from normal driving conditions. This can make it feel like you need new brakes when, in actuality, all they need is a good cleaning. 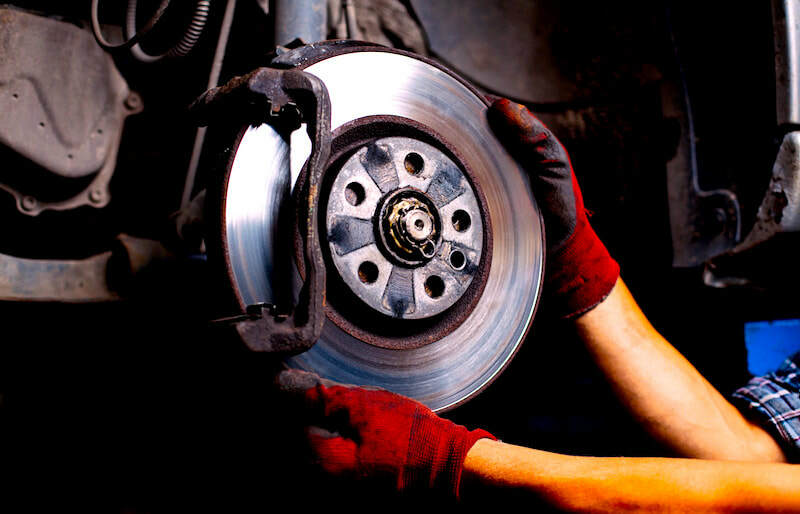 We can clean the brakes and rotors for you and give you back that smooth ride that you’ve been missing. Calipers – The calipers are responsible for squeezing the brake pads against the tires. At times, the calipers can become unbalanced, causing your brake pads to wear unevenly. Felix Auto and Tire can easily adjust your calipers to the correct pressure setting. Leaks – Leaks in the brake system can let air in or brake fluid out. Both of these circumstances can lead to shuddering, noise, and even brake failure! Just a small leak can lead to much bigger problems. Let Felix Auto and Tire help you with all your brake repair and replacement jobs!